Automotive microcontrollers are integrated chips, which enable control over the automobile functioning. Compact microcontrollers comprising least component designs are integrated into automobiles for performing activities that need functionalities such as monitoring and controlling. Growing electrification of drivetrain by Tier I suppliers and OEMs is considered to significantly propel adoption of microcontrollers in automobiles in the upcoming years. Governments across the globe have introduced stringent automotive security and safety norms concerning environmental impacts of production processes and materials used for automotive microcontrollers. With increasing modernization of vehicles, demand for microcontrollers is gaining an upsurge, particularly in applications such as airbags and advanced driver assistance systems (ADAS). Moreover, continuous evolution has been witnessed in the automated electronic control technologies for electronic power steering system, electric control suspension and ADAS. A key trend currently being observed in the global market for automotive microcontrollers is production of vehicles equipped with advanced technologies that have optimized weight to cost ratio. 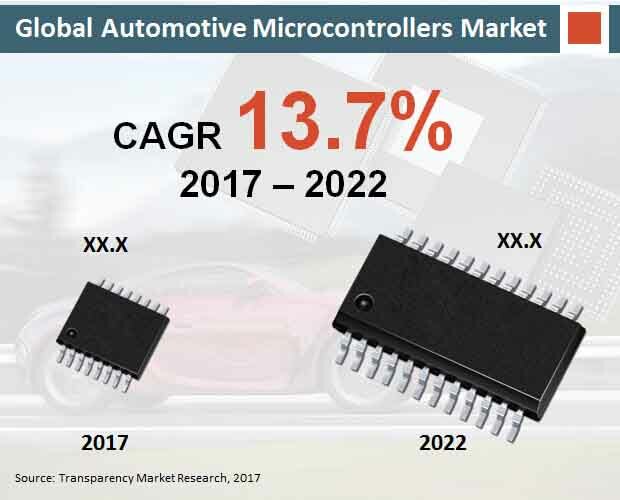 A new report by Transparency Market Research (TMR) projects the global automotive microcontrollers market to showcase a splendid expansion at a CAGR more than 10% throughout the forecast period, 2017 to 2022. Global sales automotive microcontrollers are estimated to account for over US$ 1,600 Mn revenues by 2022-end. Most of the vehicles in North America have already been equipped with advanced body electronics and safety features, which in turn has driven the market for automotive microcontrollers in the region. North America stood at the forefront of the global automotive microcontrollers market in 2017. However, the market in Asia-Pacific excluding Japan (APEJ) is projected to surpass that in North America by 2022-end, in terms of revenues as well as CAGR. The market in Middle East & Africa is anticipated to exhibit a robust expansion through 2022. Japan will remain the least lucrative market for automotive microcontrollers, with sales poised to reach nearly US$ 100 Mn in revenues by 2022-end. Sales of automotive microcontrollers for application in ADAS, functional safety technology, and start-stop system are expected to register similar CAGRs through 2022. Electric control suspension is anticipated to remain the fastest expanding application of automotive microcontrollers throughout the forecast period, followed by electronic power steering system. In contrast, parking assist system application of automotive microcontrollers will witness a sluggish growth through 2022. Based on vehicle type, heavy commercial vehicles are expected to account for the largest revenue share of the global automotive microcontrollers market during the forecast period, followed by premium passenger cars. In addition, light commercial vehicles will also continue to account for a major share of the market, in terms of revenues. Sales of automotive microcontrollers in light commercial vehicles are projected to register the fastest expansion through 2022. Tinned steel with continue to be preferred among materials used for production of automotive microcontrollers. Revenues from sales of tinned steel-based automotive microcontrollers will reach approximately US$ 600 Mn by 2022-end. Accounting for slightly more than 30% revenue share of the market, copper alloy will remain the second most lucrative material for automotive microcontrollers throughout the forecast period. Players in the global market for automotive controllers are making more investments in the development of software essential for proper automobile functioning. TMR’s report has profiled active players in the global market for automotive controllers, which include Infineon Technologies, Toshiba Corporation, Fujitsu Limited, Maxim Integrated Products, Inc., Microchip Technology Inc., Renesas Electronic Corporation, Silicon Labs Private Limited, NXP Semiconductors NV, Texas Instruments Incorporated, and STMicroelectronics NV. Transparency Market Research (TMR) has recently published a report that explores the market for automotive microcontrollers at a global scale, and covers the market dynamics exhaustively, providing major trends impacting the market growth. This report on global market for automotive microcontrollers provides a detailed knowledge base for players who seek expansion of their presence globally. Insights offered in this report is instrumental for market players and investors, for gauging potential of the bubble wrap market’s growth across the globe in the upcoming years. Beginning with the automotive microcontrollers market’s executive summary, the report delivers key research findings on the product and regional segments, coupled with most significant market numbers. Historical CAGRs (2012 - 2016), and forecast CAGRs (2017 - 2026) are offered with these market numbers. The executive summary also delivers information concerning lucrative regions for expansion of global automotive microcontrollers market depending upon sales expansion rate, and revenue shares over the forecast period. Following the executive summary, the report provides a chapter on the overview of global market for automotive microcontrollers, which offers a brief market introduction followed by formal definition of “automotive microcontrollers”. The overview conveys report readers about the report’s scope. Following chapters in the report offer information on key market dynamics including drivers, restraints, opportunities & trends influencing the market expansion. The report also encompasses analysis on cost structure, supply chain, and raw material sourcing strategies adopted by market players. The report also delivers segmentation analysis of global market for automotive microcontrollers. The market segmentation is done based on the material type, application, vehicle type, and region. Chapters delivering segmentation-wise analysis include crucial market numbers pertaining to market share comparison, year-on-year growth comparison, and revenue comparison. Region-wise, the report categorizes global market for automotive microcontrollers into Europe, North America, Latin America, Middle East & Africa (MEA), Japan, and Asia-Pacific excluding Japan (APEJ). The report provides an intensity map, which plots presence of prominent players in global automotive microcontrollers market. In its concluding chapter, the report delivers insights on these market players, along with information on the market’s competitive landscape. Profiling key market players in detail, the report provides information based on key financials, key developments, SWOT (strengths, weaknesses, opportunities, and threats) analysis, company overview, and product overview associated with the particular company. The chapter on competitive landscape is invaluable for readers of the report, as it comprises all necessary insights to analyse contribution of leading players to the market expansion. In addition, this chapter helps in studying the way of strategy implementation of these market players, and their aims to stay at the top in this highly competitive market. TMR’s report on global market for automotive microcontrollers is supported by an extensive research methodology that relies on primary and secondary research to glean every necessary information pertaining to the market. Qualitative aspects gleaned from various industry experts and key opinion leaders have also been adhered to while preparing the report. Information acquired is validated over and over by FMI’s analysts to provide the most accurate insights on the market. The information offered in the report may be used as an authoritative source by clients.